Sorry I’ve been working on the Website Theme etc recently so the releases have been stagnated as well as that I had an idea that our site was going to be migrating and didn’t release this chapter. If possible please add this to your Novel Updates Reading List , please do leave a review as well. “Where’s the problem? Why is Ye Lu Samo’s tribute so little?” Zou Liang asked. “Honestly, the heart of this matter lies in Spirit Engraving. Head Priest Tuo Ma Si’s roots are as an Engraving Priest, and these years Spirit Engraving has been completely dominated by the Spirit Engraving Masters Guild to the point that Engraving Priests have pretty much disappeared and caused their prestige to plummet. Although the temple represents the Beast God, the degree of faith also depends upon the temple’s influence.” Ai Wei Er helplessly explained. In Ye Lu Samo, the Spirit Engraving Masters Guild was the most outstanding, and in all honesty the same was true in most places. Taxes and tributes would bring conflict, and Tuo Ma Si was also at a disadvantage towards the Ye Lu Samo Magistrate named Sa La (Sà Lā). The Spirit Engraving Masters Guild and the Magistrate had both joined hands to conspire for their own benefit, and if this continued, the temple’s prestige would eventually never return. Towards Zou Liang’s shameless boasting, Ai Wei Er only laughed. This was a situation that was irreversible; no one had any method to end the power struggle between the three large powers. Scheming in his heart, Zou Liang no longer kept asking about this issue and proceeded to spend the entire day reading books with Ai Wei Er. Ai Wei Er’s book collection was plentiful, and what he had seen last time had only been the tip of the iceberg; there were even more books with all sorts of practical applications. Either way, the place catered food and drink and he also had Ai Wei Er to accompany him, so even after reading for an entire day he still did not feel tired. “We’re all one so there is no need to be courteous, and we need to interact often,” Zou Liang replied. Ma Lu’s face flushed completely red with excitement, as he was part of the small group that knew of the inner circle’s information. The ability to Engrave had no correlation with age, and after attaining the former, hearing that Ya Se was going to give him pointers had left him excited to the point that he did not know what to say. Zou Liang by now had also learned how to give favours and friendship. After Zou Liang arrived at the main hall of the temple, Tuo Ma Si was currently devoutly praying and looking at the Beast God’s enormous sculpture. Zou Liang couldn’t help but mutter a few words, as he could not tell whether this sculpture was made of pure gold. “The Rui Bo Te tribe are devout believers. Very good, if you have time, go and make some connections,” Tuo Ma Si said in a very straightforward manner; he knew that Ya Se was a smart person and understood what he meant. “Master, is there something wrong?” Zou Liang could see that there was definitely trouble brewing. “Tomorrow, Magistrate Sa La is hosting a banquet that we have been invited to,” Tuo Ma Si said with indifference. “I have the Beast God’s Medal of Honour. I can bring it out later and scare the life out of their bodies.” Zou Liang was definitely not a person afraid of trouble. “Master, you can relax. I’ll just let them start throwing stones at their own feet.” The larger the stage, the more excited Zou Liang would become. The debt the Engraving Masters Guild owed from chasing him out had not yet been collected, yet they had sent themselves to his door on their own. Zou Liang and Tuo Ma Si were very clear that the opponent was very powerful and this was obviously not a planned opportunity for the temple to increase its influence. Although the Dual-Engraving Method was attractive, there was the factor of its success rate. The consumption required for plain-grade equipment was little, but the further one progressed from the beginning, the less they had to spare; failure was not something that everyone could support. The next day, Zou Liang was the same as always and did not make any changes just because of the banquet. The Magistrate’s mansion was brightly lit and the bright and spacious room seemed to Zou Liang to be the Beastmen’s archetypical Ancient Roman design. It was very comfortable and luxurious, and if this official residence could be sold it would not receive a small price. An endless stream of horse carriages later and the front of the Magistrate’s mansion was already filled with all manner of luxurious carriages and even a group of coachmen. A banquet like this was also a contest between the high-class members of the Beast Tribes. From Ai Wei Er, he already understood the overall situation: it was the Magistrate Sa La’s fortieth birthday and despite the young age, Sa La was definitely showing promise. The Lai Yin tribe’s future prospects were bright, and at such an auspicious time they could even become the governor of the Holy Province. In terms of equipment, the temple’s horse carriage was slightly inferior. Zou Liang knew that his cheap master could be considered a good person and lived a very plain life, but this kind of thing was actually quite important; Zou Liang needed to advise him a little more next time. Zou Liang’s heart was thoroughly displeased; he’d been forced to humble himself and had been taken advantage of. He’d make sure to throw it all back later. Courteous greetings, courteous greetings, and yet more courteous greetings. This was like a drinking party without restrictions, and before the lord had made his speech, everyone could eat and drink to their own accord. This was effectively a place and opportunity for each of the large powers to congregate. Aside from the older crowd, there were also no small amount of youths, apparently the older generations’ descendants showing their faces. The youths of their generation would communicate and consolidate some affection for each other. 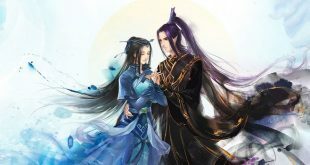 Zou Liang had originally believed he would be very lonely, but he had not considered that he would meet Ke Te and Lan Di. Those two rascals couldn’t help but to argue even in such a setting, though the corner didn’t offer these students an opportunity to show off and they did not dare to be too rampant for the sake of their elders’ reputations. “When do you two not argue?” Zou Liang laughed. “Hehe, you have come too, Ya Se. The timing is just too good, you can become our judge. How is Ai Ma (Ài​ Mǎ)?” Lan Di pointed towards a girl who was like the moon wrapped up in the stars, fair-haired with blue eyes and dazzling skin that was spotless. With only one look, it was clear that she was from the Lai Yin tribe and was the textbook example of a refined beauty. Flamboyant and prideful like a princess, in Ye Lu Samo City she indeed had a status like this. Ke Te and Lan Di both laughed; this rascal was going to cause trouble again. “Oh, but I don’t want to talk to someone without manners,” Zou Liang said with indifference.